Jackie Hollins Lee ascends the steps of the Beaufort College Building, walking in the footsteps of her late father, James Hollins. 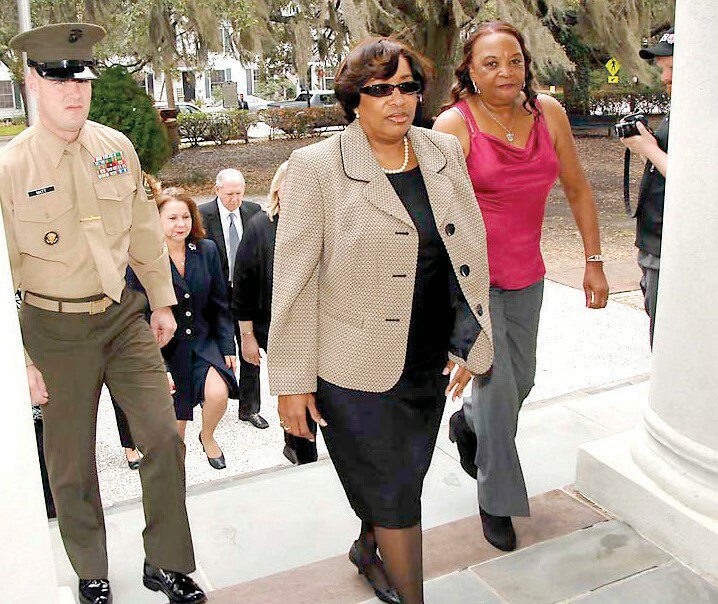 She is escorted by Master Sergeant Christopher Allen Matt and accompanied by James Hollins’ sister, Nancy Hampton. In ascending the stone steps of the Beaufort College Building on the university’s Historic Beaufort campus Friday morning, Ms. Jackie Hollins Lee, the daughter of James Henry Hollins, and her aunt, Ms. Nancy Hampton, were walking in the footsteps of Ms. Lee’s late father, the first African-American student admitted to the university. The two-day series of events conducted on the university’s Historic Beaufort campus and its Hilton Head Gateway campus included classes and informal meetings with students, faculty, and staff, the Beaufort campus walk, and culminated in a formal public ceremony on the Beaufort campus. One of Mr. Hollins’ three surviving children, Ms. Lee is Vice President of Information Technology for the Federal Reserve Bank of Atlanta. She has served the Federal Reserve Bank for more than 30 years. It’s been a remarkable two days,” Ms. Lee told the assembled guests. The Hollins family commitment to education originated with her grandfather, affectionately known as “Big Daddy,” who instilled in his children the importance of education. Among those paying homage to Mr. Hollins and to the peaceful integration process at USCB was Rep. Kenneth F. Hodges, D-Dist. 121 (Colleton), a member of the South Carolina House of Representatives and pastor of the Tabernacle Baptist Church on Craven Street. Jackie Hollins Lee and Nancy Hampton delight in materials from the University of South Carolina’s exhibition entitled 1963-2013: Desegregation—Integration. told more than 100 guests assembled in the Center for the Arts on Carteret Street. “He, along with others, applied, completed the application process and he was admitted. “James Hollins made up his mind that he would go where none other had gone before. I can only imagine his courage as six Marines walked with him and they were determined to watch his back…And that’s what they did. They walked the halls and they watched James Hollins’ back. 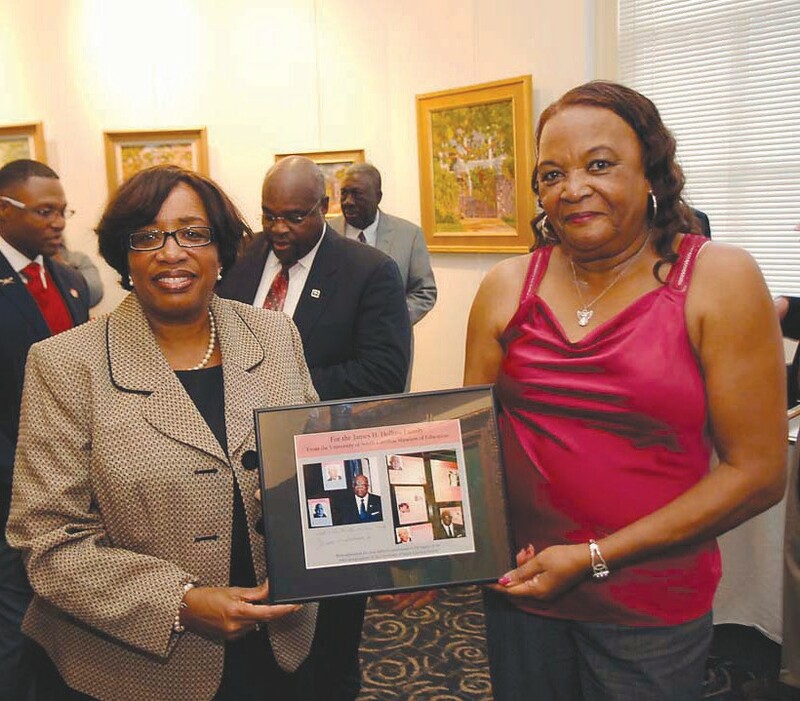 Rep. Hodges presented the Hollins family with a framed copy of the Joint Resolution sponsored by Rep. Hodges in the South Carolina House of Representatives, with the concurrence of the South Carolina Senate, honoring the memory of James Henry Hollins, “who, on Sept. 12, 1963, acted on his personal commitment to open doors to public higher education institutions to all citizens and to enroll as the first African-American student at the University of South Carolina Beaufort.” A framed proclamation was also presented to Lynn Mc- Gee, Ph.D., vice chancellor of Advancement at USCB, honoring the university for its commitment to equality in education.